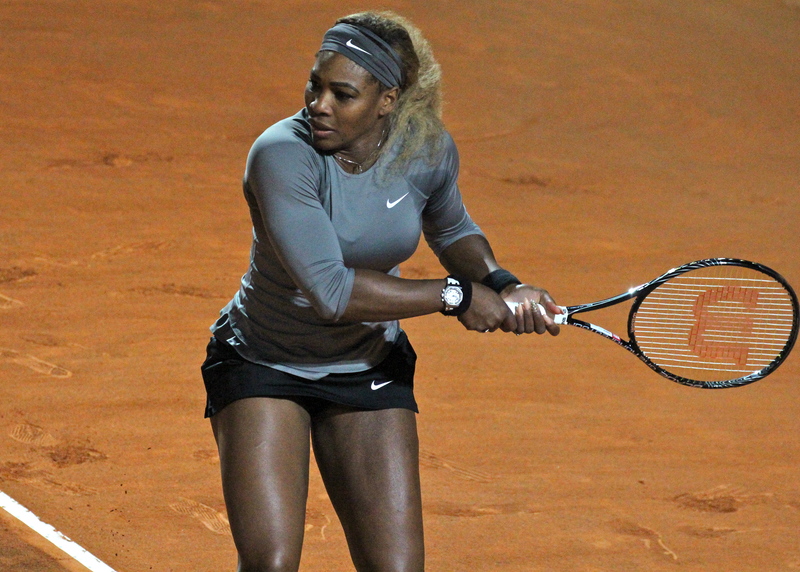 There was something of a “will she, won’t she” buzz in Rome after Serena Williams pulled out of the Madrid Premier quarter-finals earlier this month with a thigh strain. Would she be fit to return to Rome to defend her title? …and see tonight how [the leg] feels… We’ll see as the week goes on. As it turned out, she and the leg in question clearly felt pretty good. She took on a tough draw—Charleston champion Andrea Petkovic in the first round, Stuttgart finalist Ana Ivanovic in the semis to name a couple—and won the title for the loss of just three games in the final. She’s thinner, so she has more opportunity to fit the clothes! But while the issue of her injury was covered in just a couple of sentences, she had plenty to say about herself and how this 32-year-old world No1 views her career from here. She admitted that, much as she still loves the sport, her ride atop the elite of the game will not last forever. I am nearing the end of my career, I guess. Who knows when it’s going to end? But when she was asked about whether she had pulled out of Madrid as a precautionary measure, she showed just what almost 19 years on the tour—she turned professional as a 14-year-old in 1995—has taught her, though no doubt assorted injuries and a life-threatening pulmonary embolism in 2011 also had their impact. I don’t do anything out of precaution anymore. You live once and anything can happen tomorrow. [In Madrid], I physically couldn’t play, had a lot of pain and was unable to continue. When I am playing, I want to give 100 percent, I want to go out there and give the fans everything they deserve and everything they came to see, and I wasn’t even close to being able to be there. She went on to reminisce about winning her first Wimbledon, and how the pressure she once felt has now lifted. Essentially, she now feels she has nothing to prove—and that seems to have become quite a liberating thing. It’s weird in different stages of your career. I remember winning Wimbledon for the first time—and I think I defended it? [She did, winning back-to-back titles in 2002 and 2003, and going on to win it three more times.] But I don’t remember feeling pressure, or feeling nervous. And it’s funny, throughout my career I’ve felt like I have to defend, I have to defend. But now I’m at a point in my career when I don’t have to do anything. Obviously I wanted to win Madrid, I would love to win Rome, obviously I would love to do well in Paris. But I don’t feel that pressure any more. Now, it’s all in the pleasure of playing. In truth, to dominate the tour in your 30s and win 11 titles in a season, as she did in 2013—and not any old titles but two Grand Slams, the WTA Championships and a clutch of Premiers—shows not just physical prowess and huge talent but a real lust for the game. And that shone through as she talked about Rome. It’s so funny. I love coming here to play on the clay—the challenge of having to be more consistent and having to be that much better, and for me, it’s a great challenge. I really, really thoroughly enjoy it and look forward to doing it often. Having defended in Rome, then, she moves on to attempt the same at Roland Garros, where she took the 2013 title more than a decade after winning her only other French Open title, and it’s hard to see this remarkable 32-year-old not going on to win her third title in Paris in two weeks’ time. Quite apart from being the only woman this season so far to win three titles, her biggest rival, Victoria Azarenka, is again absent from the competition with a foot injury. Nevertheless, she has a tough draw, with sister Venus her first seed and the woman who beat her at Wimbledon last year, Sabine Lisicki, as her second. Then, as luck would have it, her old rival, the 2012 French Open champion and No7 seed Maria Sharapova, has fallen into her quarter. And in the wider scheme of things, Sharapova’s clay credentials over the last three years have been second to none. Since losing the French Open semi-final to eventual champion Li Na in 2011, she has put together a 47-4 win-loss record. And this year, she has already won Stuttgart and Madrid, though she came undone against another former French champion, Ivanovic in the third round of Rome. But Sharapova’s problem has always been Williams. The Russian carries 15 straight losses, and her other three losses on clay prior to Rome were all to the American. Last year alone, Williams beat Sharapova in the Madrid and French Open finals as she put together an unbeaten 28-match stretch on the red dirt of Charleston, Madrid, Rome, Roland Garros and Bastad. Before Rome, there was a slight glimmer of hope for Sharapova when Williams picked up her Madrid injury. And while there was little sign of trouble in Rome, the promised damp and heavy conditions in Paris may take a greater physical toll on any lingering injury. However, while Williams knows she has little to prove to anyone, it’s hard to imagine she would not be inspired—just as her 32-year-old male counterpart Federer will be—at equaling fourth place (with Chris Evert and Martina Navratilova) on the all-time record of Major champions: 18 of them. Even the greatest champions get lifted by that kind of target.